Kasco VFX Series Aerating Lighted Fountains set the standard by which all aerating lake & pond fountains are measured. These units deliver both superior oxygenation and aesthetic brilliance, making this a true dual-purpose fountain. As the leader in pond aeration, our VFX aerating lighted fountains have been designed with our clog-resistant technology to ensure you are buying the most efficient unit on the market. Use our VFX Series in your pond, on the lake, in a landscaped water body, or even in industrial applications to help promote evaporation. Great for medium size lakes and ponds and when multiple fountain patterns are desired for a beautiful look day or night with colorful lights. Flexible, affordable, and brilliant lighting packages for your VFX lighted fountain. Designed and engineered with our one piece composite housing and ultrasonic weld, these are the most durable water fountain lights on the market. Designed and engineered with our one piece composite housing and ultrasonic weld, these are the most durable water fountain lights on the market. Additionally, each fixture includes it’s own splitter cap allowing customers to leave main power cord in water along with unit power cord when units are pulled for service or winter storage. 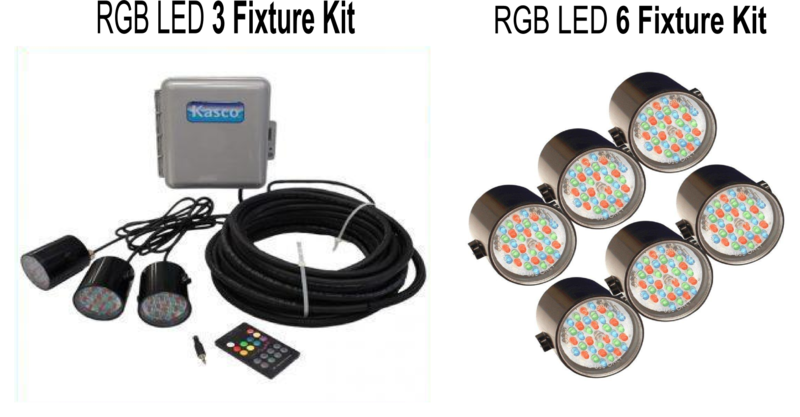 Available in a 3 fixture (compatible with 1/2HP – 1HP) or 6 fixture (2HP) kit, this color-changing RGB Lighting is built with the same durability you expect from Kasco. Our 1-piece composite housing and a secure weld around the lens ensures a leak free assembly and the unit can be mounted with standard bracketing. Additionally, each fixture includes it’s own splitter cap allowing customers to leave main power cord in water along with unit power cord when units are pulled for service or winter storage. Enhance your lake or pond with this lighted fountain with a variety of lighting options. Choice of Cord Lengths: SJTOW underwater rated power cord length options of 50′, 100′, 150′, or 200′. Includes two 50′ braided nylon mooring ropes.